Chanameed: ($15, 124pp, 6X9″, Print IBSN: 978-1-503289-11-6, EBook ISBN: 978-1-68114-015-5, LCCN: 2014920860, November 27, 2014, Buy on Amazon or CreateSpace): is a novel in verse, set in a fictional village on Long Island. The present volume also contains the London cycle “Down in the Tube Station (Not Necessarily at Midnight)”, as well as other verses. 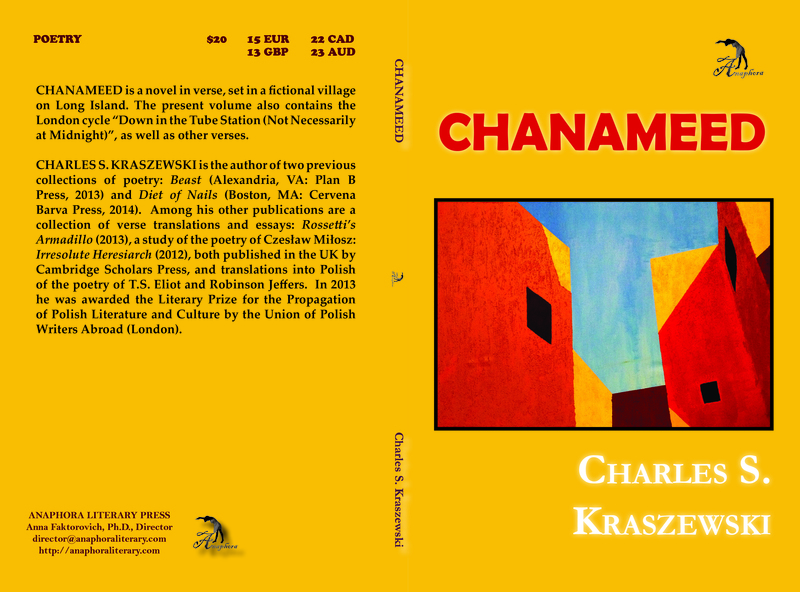 Charles S. Kraszewski is the author of two previous collections of poetry: Beast (Alexandria, VA: Plan B Press, 2013) and Diet of Nails (Boston, MA: Cervena Barva Press, 2014). He served as the editor-in-chief of The Polish Review, the scholarly quarterly of the Polish Institute of Arts and Sciences of America. Among his other publications are a collection of verse translations and essays: Rossetti’s Armadillo (2013), a study of the poetry of Czesław Miłosz: Irresolute Heresiarch (2012), both published in the UK by Cambridge Scholars Press, and translations into Polish of the poetry of T.S. Eliot and Robinson Jeffers. In 2013 he was awarded the Literary Prize for the Propagation of Polish Literature and Culture by the Union of Polish Writers Abroad (London). He is a professor of English at King’s College.